Rangers have this morning been linked with a move for West Brom’s imminent free agent, Gareth McAuley. 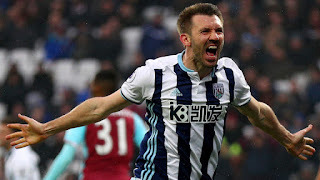 The 38-year old centre back is set to be released after a near decade at the Hawthorns, and manager Steven Gerrard has been credited with an interest him, following similar interest in West Ham’s outgoing veteran James Collins. Rangers are set to clinch Gerrard’s first outfield defensive signing over the next while in the form of Connor Goldson, but it is being reported that existing defenders Bruno Alves and Fabio Cardoso are not in Gerrard’s plans moving forward and the 38-year old intends to overhaul the entire back line. The potential combination of McAuley and Goldson would certainly be the leader and foil pairing which works so well at the back, the older veteran and the younger upstart. For McAuley’s part he would certainly be one of the oldest CBs to ever play at Ibrox, with the near-80 cap Northern Ireland international having a stunning scoring record for a defender, having bagged seven goals the season before last. With a tonne of EPL experience on his CV, the only thing slightly against McAuley is age and Rangers would still look to get a season or two out of him. Excellent signing! I have mentioned him on here a few times as someone we should sign. I swear mark allen must be reading IN. We should ask Joey Barton if we could get Clint Hill back, and ask him to bring back Joeys coffee maker! For goodness sake IN, behave yourselves!! The players in the SPFL will jog past this guy, he is well past it, even FB Kris Boyd would score by him, as he did with the garbage defenders we had last season, including Danny Wilson!! Quality Centre Halves needed, not pension chasers!!! Forget him,we are seeing some new faces, and with what we have we could be a good side in the making if SG can make what we have work harder and get 100% out of them then we could be on them,i just hope they do not buy any new players that could put the ball back in there court. Too OLD. There's nothing in the rule book that says we need to sign players in their mid to late thirties.We just got rid of a great club servant in Kenny Miller who was considered past it at 38.